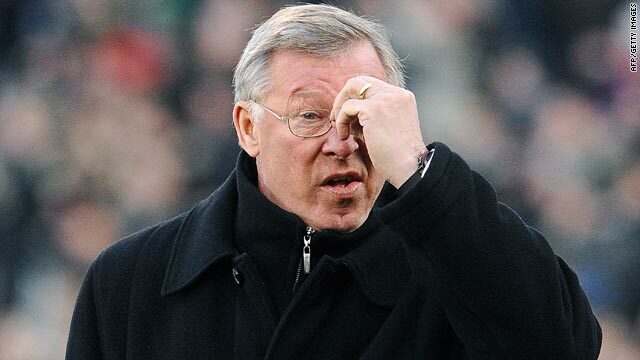 Manchester United manager Alex Ferguson could not believes his eyes as his side lost 3-0 at Fulham. (CNN) -- Manchester United's title hopes suffered a big blow as Alex Ferguson's injury-hit side crashed to a 3-0 reverse at Fulham on Saturday. Defending champions United's fifth defeat of the English Premier League season means that leaders Chelsea can go six points clear with victory at relegation-threatened London rivals West Ham on Sunday, one match short of the halfway stage. Fulham, who beat United at Craven Cottage last season and qualified for the last 32 of the Europa League in midweek, consolidated ninth place in the table and are just three points behind Manchester City in sixth. Big-spending City won an enthralling clash with 10-man Sunderland, triumphing 4-3 despite the club revealing during the match that a statement about the future of under-pressure manager Mark Hughes would be made later on Saturday night -- he was subsequently sacked and replaced by former Inter Milan coach Roberto Mancini. The Welshman's position had been in some doubt following the 3-0 defeat by top-four rivals Tottenham last weekend, which was only their second reverse in the league but came on top of an extraordinary eight draws from 16 previous outings. Tottenham built on that victory with a 2-0 win at Blackburn that sent Harry Redknapp's team briefly back into fourth place, but Arsenal overhauled both their London rivals and Aston Villa to go third with a 3-0 win over Hull in the late game. Arsenal went ahead of Villa on goal difference on 35 points -- two behind United -- as Martin O'Neill's team earlier continued their surprise charge up the table with a controversial 1-0 win at home to Stoke. Fulham, meanwhile, took advantage of a weakened United line-up that saw midfielders Michael Carrick and Darren Fletcher moved into defense alongside inexperienced center-back Ritchie de Laet. Former England midfielder Danny Murphy netted the opening goal in the 22nd minute after robbing the veteran Paul Scholes and firing a low, bouncing shot past stand-in goalkeeper Tomasz Kuszczak. In-form striker Bobby Zamora doubled the lead straight after halftime with his fourth goal in three games after United States midfielder Clint Dempsey beat Fletcher in the air to head down Damien Duff's cross. Ferguson brought on Dimitar Berbatov to make a three-pronged strike partnership with Michael Owen and Wayne Rooney, but it was the London side who sealed victory with 15 minutes to play as Zamora teed up Duff for a clinical volley. Arsenal, who have a game in hand on the teams immediately above and below them, went into the game at home to Hull without injured captain Cesc Fabregas but took a 1-0 lead through midfielder Denilson's free-kick just before halftime. Home goalkeeper Manuel Almunia saved Geovanni's penalty 11 minutes after the break, and Arsene Wenger's team wrapped up victory as striker Eduardo scored soon after from close range and then his provider Abou Diaby netted 10 minutes from time. Villa moved to within two points of second-placed United as substitute striker John Carew scored the only goal against Stoke to clinch a fourth successive win. The Norwegian headed in Ashley Young's cross after an hour, but the 11th-placed visitors were aggrieved after Mamady Sidibe's first-half header was disallowed for a debatable push on Stephen Warnock. Tottenham bounced back from revelations that the players had defied Redknapp by having a secret Christmas party as England striker Peter Crouch scored both goals at 13th-placed Blackburn. Redknapp has stated he will take disciplinary action on Monday, but his mood may be mollified after Crouch doubled his league tally this season -- heading Niko Kranjcar's cross in off the bar in first-half injury-time and then netted the second with eight minutes left. South Africa striker Benni McCarthy hit the woodwork twice for Blackburn. Manchester City went 2-0 up within 13 minutes at home to Sunderland in a goal-packed first half as Roque Santa Cruz and Carlos Tevez struck, the latter from the penalty spot after Craig Bellamy was fouled. But Sunderland leveled within 11 minutes as John Mensah headed home and then a mistake by Kolo Toure let in Jordan Henderson. Bellamy made it 3-2 in the 35th minute from Shaun Wright-Phillips' low cross, but substitute Kenwyne Jones headed in Henderson's cross on 62 to equalize again. But Paraguay striker Santa Cruz stabbed home the winner seven minutes later, and Sunderland center-back Michael Turner was sent off in time added on for elbowing Gareth Barry. Last year's runners-up Liverpool suffered another setback in their bid to qualify for the Champions League, losing 2-0 at bottom club Portsmouth to languish in seventh place. Algeria international Nadir Belhadj struck the opening goal in the 33rd minute before Liverpool's Argentina midfielder Javier Mascherano was sent off for an ugly challenge on Tal Ben Haim just before halftime. Striker Frederic Piquionne sealed victory with eight minutes to play to inflict Liverpool's seventh defeat in 18 league games and pile more pressure on manager Rafael Benitez.